Sally Mae “Em-Em” Siso cried last Tuesday. We were in Puerto Princesa for the National Championships of the Palawan Pawnshop Junior Tennis, a Group 2 Philta-sanctioned event. Em-Em, possibly the most decorated junior netter Cebu has ever produced, was in tears. Our group of nearly 30 players and parents trekked the Subterranean Underground River. But, when we arrived at the PNS tennis court where Em-Em was to play the Girls 18 final, she was told the shocking news: You lost. By default. We did. All-smiling. But when we arrived on-court, the joy turned to tears. Maia Balce, the player Em-Em was to face in the final, would not agree to play. The travel time from the underground river to tennis court was nearly two hours. Had we known, no way would we have agreed, in the first place, on the 3 P.M. schedule. Plus, almost 30 of us (players and parents) joined the excursion — including the tournament organizer himself, Pet Santos, and his family. In our entire trip, we never got a single call or text message about the impending 3 P.M. schedule. Plus — and this is important — in the previous five days, almost all matches got delayed anyway. I’m sure Maia, in her previous games, never got one match played on time — because there were only three courts to accommodate a record 220 entries. Flexibility of schedule transpired throughout the whole tournament — and so the same thing for the final, right? But, no. The Balces — led by her mom, Pia, and Maia’s coach, Czarina Arevalo — would not relent. Everybody pleaded with the Balces, including tournament referee Bobby Mangunay. He told the dad that, in so many past occasions, they’d request for favors (scheduling, etc). Now, for the first time, he was asking for a favor: play the final. Still, the Balces said no. Why wouldn’t Maia play? Simple. Had the opponent been lower-ranked and easy-to-beat, I’m sure they would have agreed. But Em-Em Siso? Consider this: In the Girls 16 semis, Maia lost to Alexie Santos, 6-3, 7-6. Alexie? She was handily beaten by Em-Em, 6-2, 6-0. Get the point? “We want the points.” That’s what coach Czarina explained to me. You know what the difference is in Philta points? The champion receives 120 while the runner-up gets 100. A mere 20 points! Em-Em Siso doesn’t need points. The reason why we brought Em-Em along was because this was her “swan-song” event. After a decade of holding trophies and representing the Philippines, this was her final tournament. Yes, her very last. By January 1, Em-Em will no longer be eligible to join the juniors. She doesn’t care about the points. She just wanted to play. FINALLY, WE TALK. Boboy finally calls! It was around 7:30 P.M. And it had to take another side incident — when, during the mini two-point side event, Maia was booed by the Visayan contingent and un-called for comments (not by me) were said and her mom stormed the court to confront me (that’s another story!). Boboy and I got into a lengthy conversation, me explaining every reason why the final should be played (we didn’t know exact time of match; we were in a trip with 30 others; in all matches the previous days, none followed the schedule). I told Boboy that Maia not playing the final would actually not do her good. Wasn’t this trip to give his daughter more experience? Then why not play! And what kind of a victory will it be? A hollow, meaningless one? Boboy promised to talk to his wife and daughter and said he’ll get back to me. I didn’t hear from him again that night. At 6:35 A.M. the next day, he calls. We talk. He said that he tried asking Maia to play but that they’ve scheduled a visit to a beach resort. Can’t they just play the match at 8 A.M. so this issue will be settled? I asked. AIRPLANE GAME. Another funny addition to this telenova-like story? The Balces were not in a hurry to catch a flight. Their flight back to Manila was 3 P.M. — the next day! In fact, the original schedule of the final was Wednesday morning — until it was moved to Tuesday afternoon. And so there was plenty of time to play the final. Our flight back to Cebu? It was 11:30 A.M. yesterday, Wednesday. I told Boboy that Em-Em and Maia could still play at 8 A.M. Let’s settle this issue, I requested. Guess what he later told Bobby Mangunay, the tournament referee: Can Maia and Em-Em play at 12 noon, Wednesday? That’s not all. They came up with another preposterous idea: Maia will go to the court around 11 A.M. (remember, our flight was at 11:30), play a few points with Em-Em and ask to be defaulted. To “diffuse” the issue, now they wanted Em-Em to win! Crazy. Can you believe that? Obviously, they don’t know who Sally Mae Siso is. Em-Em is a two-time awardee of Cebu’s “Athlete of the Year.” These awards are given by the Sportswriters Association of Cebu (SAC) in cooperation with San Miguel Brewery. This is the most prestigious sports award in the entire island of Cebu. Who receives this once-a-year recognition? The likes of Donnie Nietes (the world champ) and Gerry Peñalosa (another boxing champ). In Cebu, Em-Em Siso is that highly-regarded. Also, her family story — she and her two siblings, Bernardine (Niño) and Sally Dine, were taught by their dad, Dino, who shockingly passed-away when Em-Em was only 12 years old — is heart-wrenching. Back to Palawan… Em-em didn’t need the trophy. She has over 100 trophies and medals at home! That’s no joke. Now they want Maia to default? To appease her? Unbelievable suggestion. All Em-Em and the spectators wanted was for the Girls 18 final to be played. AGASSI. This controversy reminds me of a story that I read many years back. 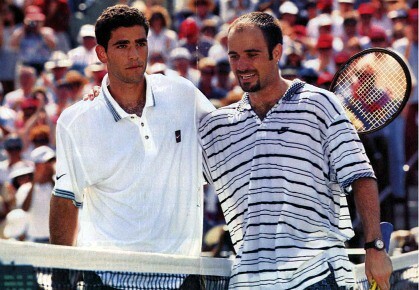 In the 1994 Lipton Championships, Pete Sampras was scheduled to meet Andre Agassi in the final. Unfortunately, Sampras ate something bad the night before and woke up feeling sick. He needed an IV injection for 90 minutes prior to the final. At their appointed time to play, Sampras was unwell and not ready. Agassi won! By walkover. The trophy was his! The prize money — $242,000; a large, large amount back in 1994 — was his. Yehey! But, wait. No. Agassi analyzed the situation. It didn’t feel right. It wasn’t the right thing to do. He didn’t want a hollow victory. He didn’t want to win without sweating. He wanted to win on the proper venue: on court. You know what Agassi did? He waited. He waited until Sampras recovered an extra hour before they played. And you know what? Why did Agassi agree to wait? It was the right thing to do. It’s called Sportsmanship. In such a highly-competitive sports world for our children, we’re often faced with two scenarios. True, we win. True, we claim the trophy. True, we gain points. But at what cost? At the cost of damaging friendships and relationships? When we’re but a small community of families who’ll often meet? At the cost of damaging our reputation… with dozens of others talking behind our backs, asking why we didn’t play? This victory is hollow. It’s empty. It’s meaningless. Given the circumstances last Tuesday — us explaining that we weren’t properly informed of the schedule; us going with 30 others on an official trip; and knowing well that the schedules were all flexible in the past days — was it the right thing not to play the final? To those who know me in the tennis community, they know that — for 20+ years since I’ve been involved with tennis in Cebu… as Philta RVP for many years and as one of the organizers (with Randy Villanueva) of last year’s two Davis Cup ties in Lapu-Lapu City — that I’ve always been friendly, fair, good and just. You can ask anyone. I dislike putting people down. That’s not my style and never will be. But what happened in Palawan, to my mind, should be explained and known by all. I hope that, as parents, we understand this: In our pursuit of win-win-win, we do not become too selfish and callous; we do not become heartless. FINALLY… this story will not end without another parang-telenova twist. Would you believe that, of the 130+ children who joined, only two families stayed in the same Tropical Sun Inn Hotel. Guess who? The Pages and Balce families. And so, for the past six days, we’d see each other at the lobby, smile, chit-chat; often having our breakfasts just a few feet apart. Yesterday (Wednesday) morning, as we were about to rush to the airport, Em-Em Siso and my daughter Jana — despite our shouts to rush to the van — just had to do a final act that would make them feel better. They knocked on Czarina’s room. Em-Em, in all kindness, said “Coach, aalis na kami.” She shook Czarina’s hand. And, as she and Jana were leaving, Em-em added, saying, “Pakisabi na rin kay Maia na ba-bay at saka sa Mama nya rin.” Despite her crying the entire night before, Em-Em had the heart to bid them goodbye. Now that’s what I call the heart of a champion. well said, john. hope many will learn that having a heart of a champion is better than getting a trophy (by default). keep on keeping on. God bless. agree! some parents would rather show their callousness than teach their kids good values.